Welcome to Night Vale is a podcast about life in a strange little desert town where every weird thing is normal and basically unquestioned. Now it's also a book. Volume 1 of the collected episodes covers the first year of the show, from the first episode through the 25th, and includes the first live show they did in front of an audience, “Condos.” Here are the first mentions of the many characters that populate the town, the first appearances of plot arcs that flow into the second season, and dozens of offhand references to weird things that come back later. Night Vale is a densely peopled and storied town, and it all starts here. In book form, without two weeks between episodes, it's easier to see the structure of the story as it's built, and it's impressively consistent. The experience of reading is a lot different from the experience of listening to the show; most notably, Mostly Void, Partially Stars showcases how very literary the writing is, without being the least bit pretentious or stuffy. 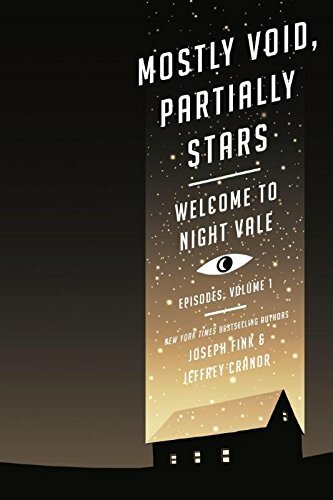 In fact, Welcome to Night Vale manages to take clever, smart, and educated writing and use it for things that usually don't get taken seriously by literary-style writing—mysterious events, bizarre changes in characters and their world, social and political satire of the strangest sort, and unreliable narrators in an unreliable world. Having the episodes written makes this aspect more fun than listening does, since it's easier to literally see how the writers play with the formats they're using. It's a mashup of small town news stories, personal development, horror, weird science, and just plain strangeness, and it shouldn’t work, but it does. There's nothing else like Night Vale. In addition to the episodes, the book contains introductions to each episode that explore how the show came to be, where the ideas for specific episodes came from, and as new characters are introduced in the story, behind the scenes snippets from the actors that play them. It's a fascinating peek into what makes Night Vale itself, as well as how it came to be; the collection of personalities and motivations and diverse backgrounds that go into the story define it as much as the goal to maintain a sense of creepy silliness with a sharp edge. More than that, though, it's a format that allows the story to be experimental, and the intros talk about the places where they tried new things and how they did. It's almost like an oral history or a study of this work of modern fiction, and it's as fascinating as the stories are. Between many of the pages are creepy illustrations by Jessica Hayworth that add another layer to the story that the radio show alone doesn't have. They're surreal and unsettling, but also somehow unthreatening, charming, and spot on for the indescribable. Her approach validates the series premise: unknowable things happen all the time, and the people that live with them move on and focus on their lives like people in any town anywhere. Altogether, Volume 1 is a beautiful book, a perfect representation in paper and physical form of something that previously only existed in sound. While the main audience of the book is probably people who love the show, it's not limited to only them; the story speaks for itself, and since the book starts at the beginning and tells its story as it goes, people who have never heard the show can enjoy it just as much as longtime listeners. And it's more than worth the ride.